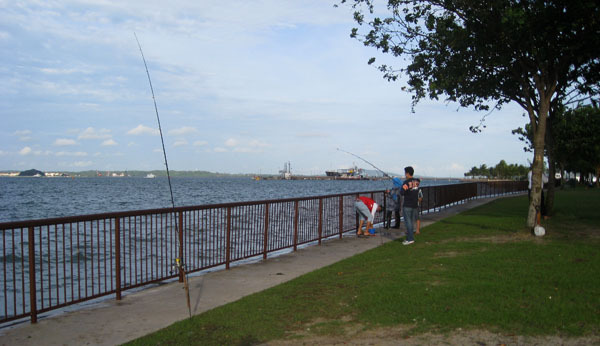 When anglers refer to fishing at Changi point, they could be referring to a few areas. 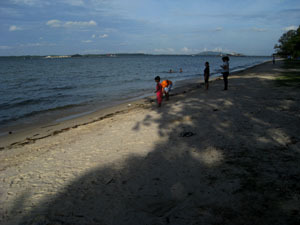 This write up will try to highlight the places where most anglers fishes from around Changi Point. 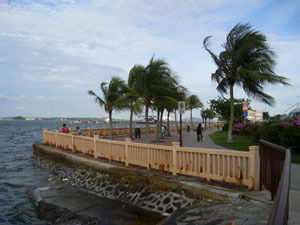 The most famous landmark at Changi point is Changi Village and it's hawker center (which serve great food). 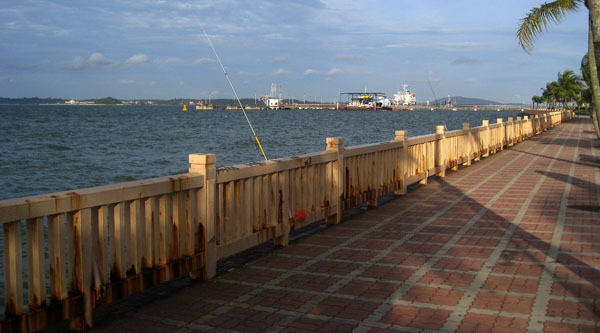 Another reason Changi Village is so popular with anglers is because there are currently 3 fishing tackle shops at Changi Village (Gary Tackle, Riverland and Changi Village Pro-Fishing) at the time of writing. 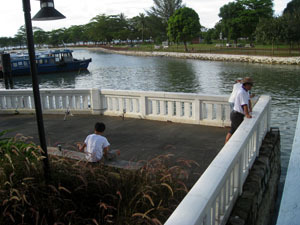 The first location you can fish from at Changi point is the area in between the Changi Point Ferry Terminal and the foot bridge. There is actually a no fishing sign around this area and the reason is obvious. This area is where the fish farms around this area loads and unload their fishes, therefore throughout the day there will be small boats parking and moving around the river directly in front of the area and also the fish farmers will be at work, so do give them the space. But at the corner of this stretch where the old immigration building used to be, there is a small area where you can fish from in the day, as shown in my pictures above. At night, once the bumboats stop moving, and the passengers and loading activities stops, this would be a great place to fish from (during high tide) and you also wouldn't be obstructing anyone then. 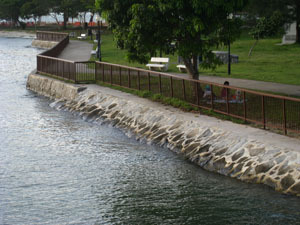 Another good spot to fish from during high tide is the river bank opposite the Changi Point Ferry Terminal, there is a railing along the bank that you can lean your rods on. This place is great for fishing during high tide, but at times during the night when the tide is low, you can also see anglers fishing here. The most common fish landed at this area are KBL- sea bass and they can be surprisingly big. 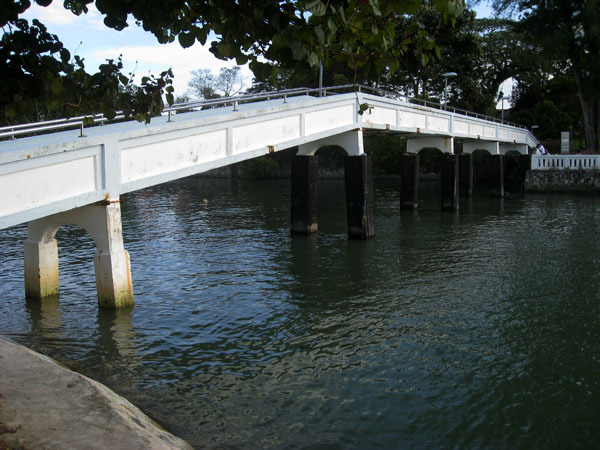 The bridge that stretch across the river that flows into Changi Creek. The bridge isn't very wide but I do see people fishing on it at time. I do not see any "No Fishing" on the bridge itself so I guess it's legal to do so. 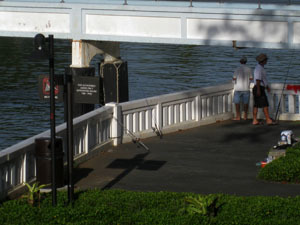 As with most crowded location, do take care when fishing on this bridge, many people uses it and there will be many children and curious watcher during weekends. Another thing you need to look out for are the small boats that traverse along the river, make sure you avoid hooking onto them. 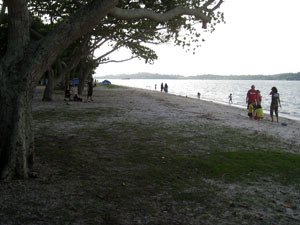 The stretch of beach that stretches from Nicoll Drive all the way along Changi Coast road are also well known to local anglers. This is surf casting haven for our surf casting fraternity. On a weekend night during a good tide it's almost impossible to walk along the water edge along the beach without encountering a fishing line that's cast out to sea very 15 meters or so. Further on the beach you will see a stretch of railing. The railing stretches for about a 150 meters and then the metal railings stops and the railing of different designs starts. Initially I though they were concrete but they could not be because they rust. 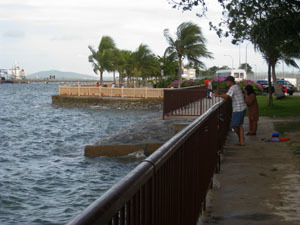 This railing stretched all the way to the Cafhi Ferry Terminal which is the pier and jetty you see in the image above. 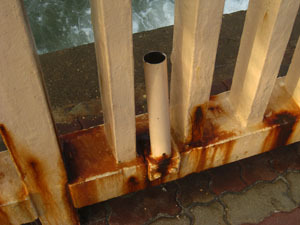 Knowing that this area is a favorite with anglers, the authority have build rods holders onto the metal railings. 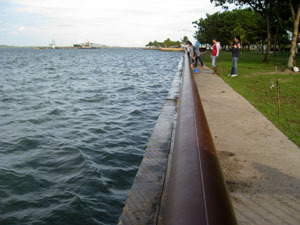 Do note that the wave around this part of Changi can get pretty high and during high tide and with a good wind blowing inland the surf could come through the railing quite easily. Pass the Cafhi Jetty is the SAF jetty were our young soldiers takes a ferry to and from P.Tekong. 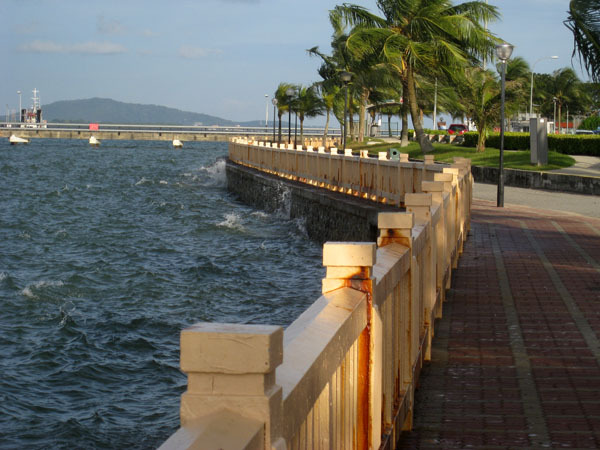 After the SAF jetty toward Airline house, the railing starts again. It stretched till near carpark six where its back to being just a beach. 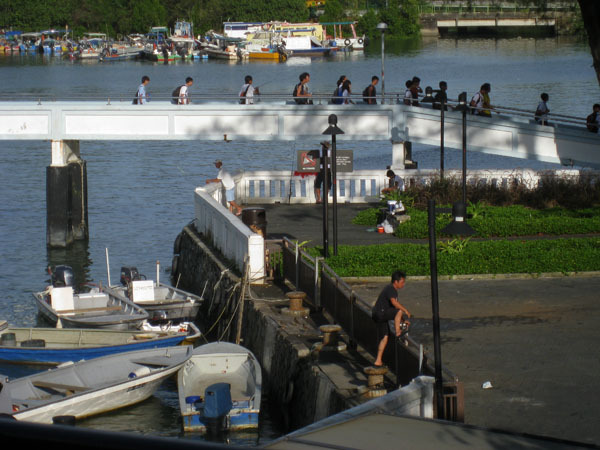 If you drive and wish to fish along the railing before the Cafhi Jetty, you should park at car park 4 or 5. 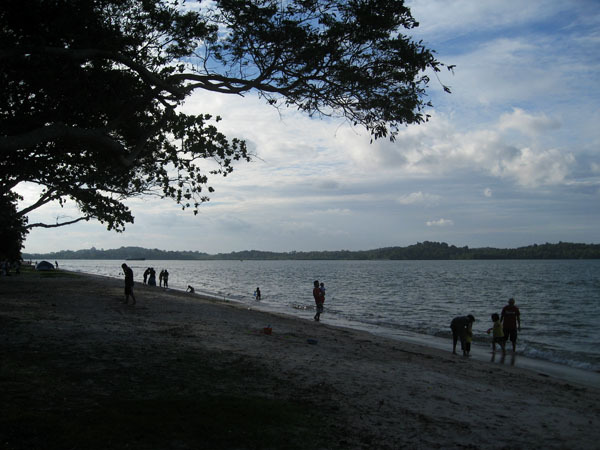 If you want to fish around the beaches, you should park at car park 1, 2, or 3 along Nicoll Drive. 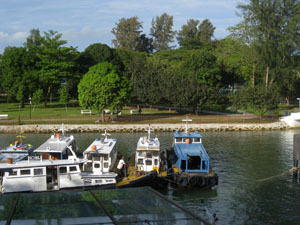 For fishing around the Changi Point Ferry Terminal you can park at the car parks around Changi Village. Bus to Changi Village Bus Terminal are 2, 29, 59 and 109. Bus to Changi Coast Road is 9, 19 and 89.